We have created this charming a Canino ( VT ) in the heart of the land of the Etruscans and we have rebuilt the magical atmosphere of this mysterious civilization . Each room has been decorated in keeping with the iconography Etruscan brightly frescoed walls , furnishings and style tents . We have developed a theme for each room : the Eros of the Etruscans , the François Tomb , Etruscan women , the jugglers , the pads of Cerveteri ; two rooms reproduce even in their internal architecture and frescoes , many painted tombs of Tarquinia , that of Leopards and Cardarelli . The exterior of the building , newly built , is a constant reminder to the characteristics of etruscan civilization . A short distance from the B & B are the necropolis of Vulci , Tarquinia , Cerveteri , Norchia and Castel d'Asso . Then the sea , Lake Bolsena . The medieval villages of Tuscania and Viterbo , the site of the destroyed city of Castro , the Civita di Bagnoregio ( the dying town ) , the Monster Park of Bomarzo . All rooms are equipped with private bathroom , air conditioning wi fi. A 9 KM FROM THE B & B THERE ARE THE THERMAL BATHS OF VULCI, NATURAL POOLS IN MAREMMA. 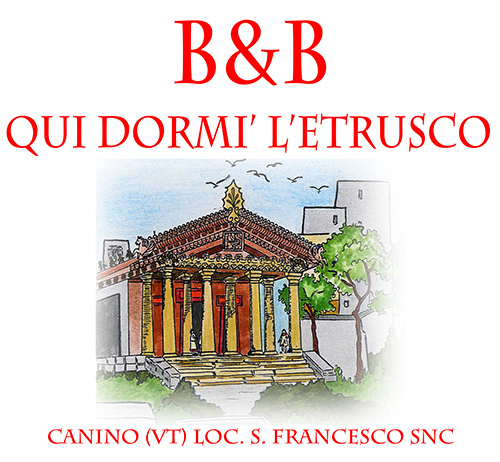 Come enjoy a vacation in the only B & B in the world where they would enjoy even if the Etruscans!